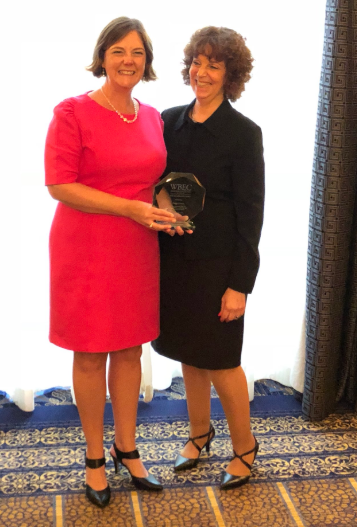 PHILADELPHIA, Pennsylvania (September 17, 2018) – Partner’s Consulting announced today that its president, Peggy Gionta, received the Women’s Business Enterprise Council (WBEC) of Pennsylvania, Delaware and southern New Jersey 2018 Leadership Award. In recognition of her leadership, business acumen, mentoring and community service, as well as for her contributions to the growth and development of other WBENC-certified Women’s Business Enterprises in her community, Ms. Gionta was presented with the award at the Annual Awards Program at The Union League of Philadelphia on Friday night. WBENC is the nation’s largest third-party certifier of businesses owned and operated by women in the United States. The WBENC certification for women-owned businesses is one of the most widely recognized and respected certifications in the nation. Accepted by hundreds of corporations within the country and a number of federal, state, and local government agencies, WBENC certification is an important marketing tool for expanding a company’s visibility among decision makers in corporate supply chain diversity and procurement organizations. Partner’s Consulting is the first and only woman-owned project leadership company that helps enterprises meet the changing demands of technology. Based in the Philadelphia area, they have differentiated themselves with Fortune 500 and 1000 clients that care about great project leadership since 2006.